I had previously written about the new lodge I-Tsu-La Lodge #99. 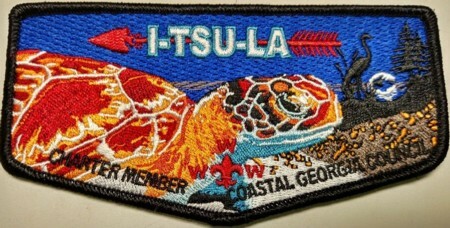 I-Tsu-La Lodge was formed from the merger of Tomo Chi-Chi Lodge 119 and Pilthlako Lodge 229 Coastal Georgia Council is formed from the merger of Coastal Empire Council 99 and Okefenokee Area Council 758. The toem is a loggerhead turtle. The First Flaps are starting to appear on eBay, and were apparently limited to 2 per member. Good thing for me this is not a NY Lodge. 🙂 Looks like two have already sold on eBay, one for the $ 500 asking price and we can infer the second for a circa $ 235 best offer.